Start Spreading The News! #MDFDEJeSuisLadyLiberty130. You are invited to attend our very first MDFDE International Conference on American immigration, Tax, Corporate law and Social entrepreneurship chaired by Ms. Sophie Raven – The Law Office of Sophie Raven New York – Executive Legal Director, MDFDE/New York. Hope to see you there! E.J. CLE: 1.5 credits in Areas of Professional Practice (at no cost) for newly-admitted and experienced lawyers. Do you have foreign clients who want to settle and invest in the United States? Which corporate structures and visa options are available to them? What tax implications do they face when living, working, and investing in the United States? 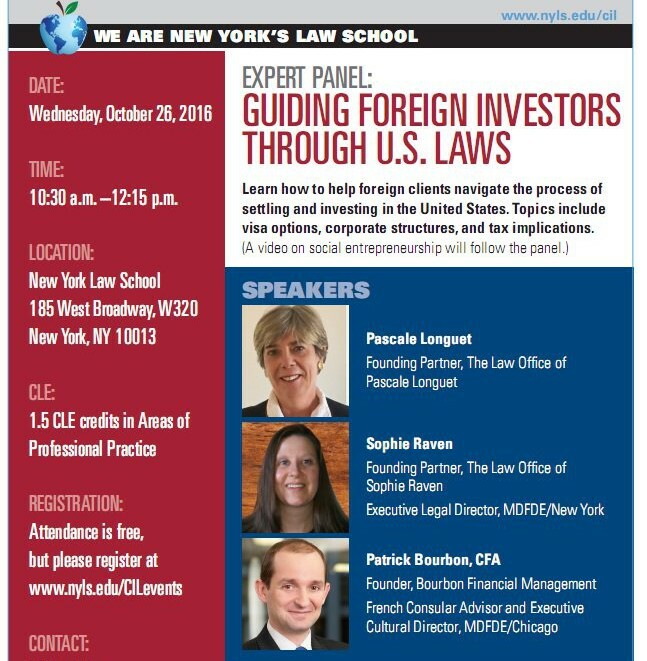 Our speakers below will discuss aspects of American immigration, tax, and corporate law which affect foreign investors and entrepreneurs. A short video on social entrepreneurship will follow the panel. Pascale Longuet (Topic: U.S. corporate structures) is Founding Partner of The Law Office of Pascale Longuet. She is a bi-cultural attorney admitted to the Paris and New York bars in 1987 and 1990. Pascale advises European and French corporate clients regarding their transactions in the United States and her practice focuses on corporate and commercial assistance. She also assists clients in matters as varied as intellectual property protection, settlement of international estates, repatriation of US assets to France on behalf of incapacitated individuals, execution of foreign judgments in the United States, arbitration and litigation. Pascale works with a network of specialized attorneys located in the United States and in France. She co-authored “Investir aux États-Unis” [Investing in the United States], Ed. Dalloz 1994, and regularly writes and lectures on the topic of corporate implantation in the U.S. Pascale previously participated as a panelist as part of the CLE program “How to launch and grow an international law practice” held at New York Law School. She is a member of the Association of the Bar of the City of New York (ABCNY), Association of the Bar of the State of New York (NYSBA), American Foreign Law Association, French-American Bar Association. She is also the former director and secretary of the Turtle Bay Association. Pascale will discuss the most common forms of legal structures available for setting up a business in the United States, and will address in more details the Corporation and the Limited Liability Company including their formation, and operation, as well as the pros and cons related to each structure. Sophie Raven (Topic: U.S. visa options) is Founding Partner of The Law Office of Sophie Raven. She is also the Executive Legal Director, MDFDE/New York. Sophie has over 12 years of experience representing clients in business and family immigration matters. She is experienced in advising clients on issues relating to the full range of employment-based visas, including investor visas, and family-based visas, both temporary (nonimmigrant) and permanent, visas for lawful permanent residence (“green cards”), and U.S. citizenship. 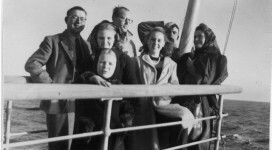 In 2011, Sophie contributed to updating Immigration Law & Procedure (by Stanley Mailman and Stephen Yale-Loer), the leading immigration law treatise. She is an active member of the American Immigration Lawyers Association (AILA), serving on the AILA New York Chapter Citizenship Day Committee. Sophie is also a member of the Immigration and Nationality Committee of the Association of the Bar of the City of New York City (ABCNY) and chairs its Business Immigration Subcommittee. She is also a member of the American Bar Association (ABA), the French American Chamber of Commerce and the French American Bar Association. Sophie earned her law degree (J.D.) from New York Law School and was awarded a Public Service certificate upon graduation. She spent one year of her undergraduate studies at l’Université de Paris VII and Reid Hall (Columbia University) in Paris where she studied Japanese and French literature. Sophie is fluent in French, and proficient in Spanish and Japanese. Sophie will discuss all of the different U.S. visa options (E-2 investor visas, L-1 intracompany transfer visas, and EB-5 investor green cards) available to foreign investors based on their long-term objectives, and the application process for each of them. Patrick Bourbon, CFA (Topic: Tax and wealth management) is the Founder of Bourbon Financial Management, and is also the French Consular Advisor and Executive Cultural Director of MDFDE/Chicago. With 20 years of investment experience, Patrick helps professionals and expatriates worldwide who want to enjoy a comfortable retirement at a chosen lifestyle by giving non-conflicted advice, and by optimizing their portfolios in a world of lower returns and higher taxes. Previously, he spent a decade as a portfolio manager and analyst at UBS specializing in equity markets. Patrick earned his CFA designation in 2003. He received his Masters in Finance with honors from the Illinois Institute of Technology Stuart School of Business in Chicago and his Masters in Engineering with honors at EPF École d’Ingénieurs in Paris. Patrick is also an adjunct professor, the President of UFEC-AFFC, Chairman of Stuart Investment, and Treasurer of the South Shore Drill Team. Patrick will discuss tax and wealth management for Europeans living in the United States, focusing specifically on the tax impact and potential penalties when foreign nationals move to the U.S. (FATCA, FBAR, OVDP), and on investing in the U.S. versus investing in Europe. Julien Barbier and Sylvain Kalache, co-founders and directors of While42, a Worldwide French Tech Engineer Alumni Network present in more than 30 cities in the world with 2000+ members will present via video their Holberton School of Engineering San Francisco and share with us their own thoughts about our iconic Lady Liberty.